X-rays of the lower back (lumbar) spine will show the position of the vertebra. Follow-up x-rays are needed to make sure the problem is not getting worse. Physical therapy – Stretching and strengthening exercises for the back and abdominal muscles can help prevent future recurrences of pain. Physical therapy can also help to increase range of motion of the lumbar spine and hamstrings as well as strengthen the core abdominal muscles. Lifestyle modifications – You may be asked to avoid contact sports or to change activities to protect your back from being overextended. Surgery may be needed if slippage progressively worsens or if back pain does not respond to conservative treatment and begins to interfere with activities of daily living. 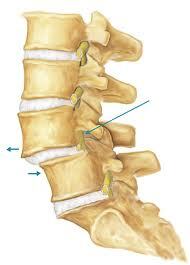 The type of surgery is based on the type of spondylolisthesis.